Contact lenses are great if your only issue is near or farsightedness, but for those struggling with age-related macular degeneration (AMD), a leading cause of blindness among older adults, those flimsy little lenses ain't going to cut it—or at least not the kind of contact lenses you're used to. But soon, AMD-sufferers could see their vision vastly improving thanks to a slim, adjustable telescope that sits right in the middle of their eye. Funded by DARPA, the joint team of researchers from the US and Switzerland were facing the problem of correcting vision loss as a result of retina damage—something that normal contacts, which simply refocus the eyes, do virtually nothing to help. By magnifying an AMD patient's vision, though, light is also magnified, allowing it to spread out and hit the parts of the retina that remain intact. 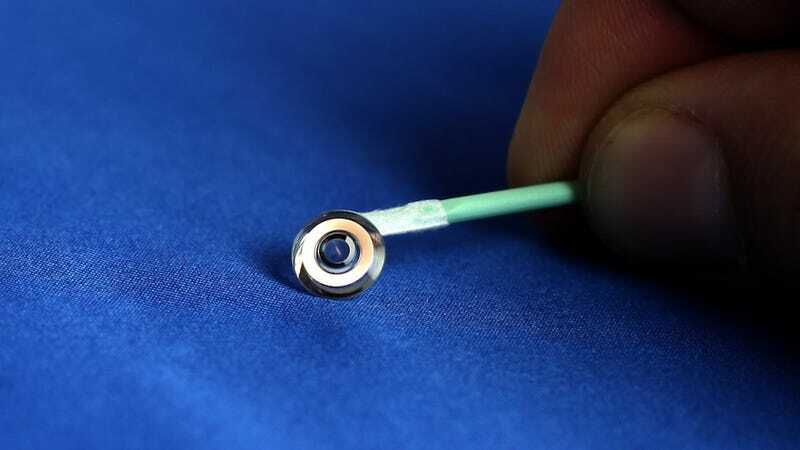 Until now, though, any sort of optical magnifier came in the form of a highly intrusive, spectacle-mounted telescope or micro-telescopes that required invasive eye surgery. The liquid crystals in the glasses electrically change the orientation of polarized light, allowing light with one orientation or the other to pass through the glasses to the contact lens. The contacts themselves are made out of a material called polymethyl methacrylate (PMMA), an incredibly strong component that allows for the small grooves necessary to fix the abnormal color that the lens's shape creates. And while these new lenses are an incredible advancement, it wil still be some time before we start seeing them on a consumer level. The same grooves that fix color also have the effect of reducing the quality of the actual image, and PMMA isn't gas permeable, which would mean that patients wouldn't be able to wear the lenses for any extended period of time.